Fire & Roses video available on DVD! Forged from a solid bar of steel. Imagine if you will a world where craftsmen are skilled enough to fashion an antique rose of intoxicating beauty from a solid bar of iron. A rose so stunningly realistic that it causes all that see it, to believe for a moment that the iron rose is actually alive. Can this be anything but pure fantasy? 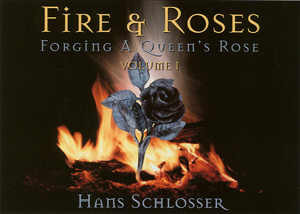 Witness it for yourself in this amateur documentary video- Fire & Roses ~ Forging a Queen’s rose. 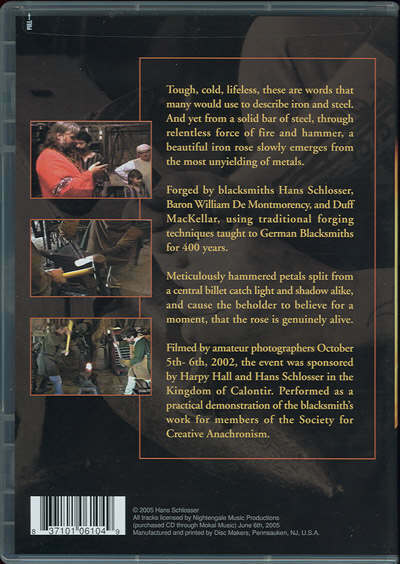 Watch as 3 blacksmiths from the historical re-enactment group The Society for Creative Anachronism; forge an iron rose using traditional methods taught to the most skilled German blacksmiths for centuries. Update May February 03, 2013. A preview video has been added to this page with highlights taken from Fire & Roses. Scroll down the page and click on the video button icon. Video is now ready for sale. Fire And Roses is now in stock for both internet orders and mail order. Price is $14.95 plus shipping. Length of video is 1-hour and 20 minutes. Online sales has been arranged through Film Baby. See ordering information further down on this page or click on the Fire & Roses picture at left. The video is not available from amazon.com yet. What is Fire & Roses? Fire & Roses is an amateur documentary showing our team of blacksmiths forging a rose from a solid bar of iron. A small group of SCA members gathered in the shop of Hans Schlosser to watch as the rose (photo at right) was forged from a solid bar of steel. Performed live for a small audience from the Kingdom of Calontir in October of 2002. Forging the wrought iron rose. 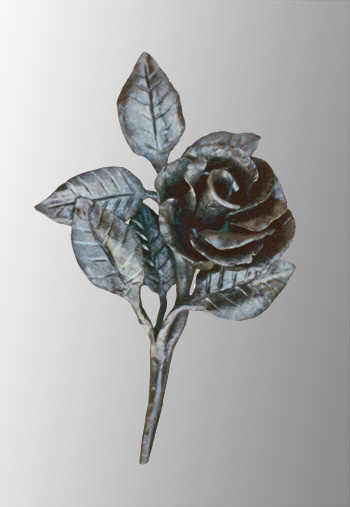 The rose was carved from a single piece of 1-1/2" round bar, using traditional forging techniques taught to European blacksmiths for centuries. Splitting and carving the layers of petals from a central billet. Leaves were forged from small bars and added by the age old blacksmiths' method of fire welding. This is not a sheet metal rose, nor is it a bar that was smashed flat and rolled up as seen on other blacksmith websites. This is the real thing! The only tools used were sledge hammers, power hammers, hand hammers, chisels, tongs, and a wire brush to clean the finished rose. If you ever wanted to know how to forge an antique iron rose then this video is for you. While it is intended as a documentary video rather than a 'how-to' video, the video will give the blacksmith a good idea of almost every step involved in forging a wrought iron rose. Nowhere else in the U.S. will one find roses made in this way anymore. See a very old forging technique brought to life once again. Format is NTSC for play on television systems in the United States. There are no country codes on this video and it can play on any DVD player in any country using NTSC format. Fire and roses was filmed with old VHS format equipment so picture is not as sharp as many people would expect from modern digital video equipment. This was a first time amateur documentary filmed on location with no professional video lighting so the camera often could not process accurate color- hot iron appearing almost white rather than orange or yellow. What the viewer will see is a live forging demonstration of an iron rose that was made in entirety in front of a small audience. Type in key words Fire & Roses in the search window and the order information for this video will appear in its own page. Or mail order this video directly from Beautiful Iron. U.S. Mail- First Class Fire & Roses DVD price $14.95 U.S plus shipping. Regular shipping anywhere in the United States add $2.90 for the first DVD plus $0.50 for each additional DVD. 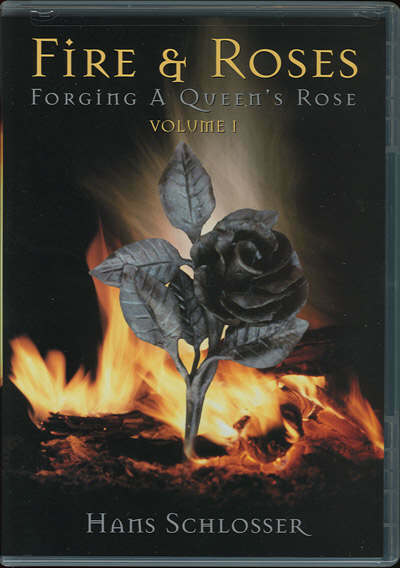 U.S. Mail- Priority Mail Fire & Roses DVD price $14.95 U.S. plus shipping Priority mail anywhere in the United States add $3.85 for the first DVD plus $0.75 for each additional DVD. For orders outside the United States send enquiry first so we can look up shipping costs. Shipping outside the US is often double the cost of domestic mail postage. Click this link: http://www.beautifuliron.com/Vid/FireAndRoses1_Preview.wmv or click on the video icon button at left for a 40 second Windows Media Player preview of Fire And Roses. File size is 1.3 megabytes. Event sponsored by Harpy Hall, an SCA household promoting the arts within the Society for Creative Anachronism. Page created on April 17th, 2004.